DRY-CONVEY-BLEND-EXTRUSION Novatec is one of the largest U.S. based manufacturers of resin drying and conveying equipment for the plastics industry. Together, with Maguire Products, we offer the largest line of manufactured resin handling equipment in North America. Product Overview: www.novatec.com/about Baltimore, MD • sales@novatec.com MELT FLOW TESTERS Melt indexer comes in manual or motorized versions and loaded with capability and efficiency: three-zone heaters; touch screen control; tapered weight design; simple die release; USB connectivity and Horizon software for SPC analyses; optional manual or motorized extrudate cutter. Horsham, PA • sales@tiniusolsen.com CLEAR-VU™ LOADING SYSTEM Provides all the benefits of a central loading system with the added convenience of portability & low maintenance. Brochure & video describe this complete vacuum conveying system that will control up to eight stations. Receivers allow full view of the loading action. Aston, PA • info@maguire.com DRY-CONVEY-BLEND-EXTRUSION Novatec is one of the largest U.S. based manufacturers of resin drying and conveying equipment for the plastics industry. Together, with Maguire Products, we offer the largest line of manufactured resin handling equipment in North America. Product Overview: www.novatec.com/about Baltimore, MD • sales@novatec.com MEDICAL DEVICE CONTR ACT MFG. Canon Virginia, Inc. offers Medical Device Contract Manufacturing. ISO 13485 certified, Canon Virginia has 30,000 square feet of manufacturing space, including a class 8 clean room, dedicated to new business. For an overview of all Canon Virginia, Inc.'s services visit cvi.canon.com/mfg. Newport News, VA • cvi.canon.com/mfg SINGLE AND TWIN SCREW EXTRUDERS 20mm Clamshell Segmented Twin-Screw Extruder: Compounding, Pilot Scale & Nanocomposites applications for product development. Clamshell barrel allows visual processing assessment, easy screw mounting, quick cleaning. Segmented screws offer numerous processing possibilities.. S. Hackensack, NJ • cwbi@cwbrabender.com PPE GATE CUTTERS - LOWER PRICES PPE offers the best variety of Gate Cutters at the lowest prices in both our Economy and Premium styles. With 74 different cutters to choose from including heated & pneu- matic, you're bound to find what you needed right here at PPE. www.ppe.com Macedonia, OH • sales@ppe.com TWIN SCREW EXTRUDERS AND SYSTEMS Twin screw extruders (TSE's) and systems— Leistritz manufactures twin screw extruders (12 to 260 mm) used for compounding, reactive extrusion, devolatilization and direct extrusion. Services include a fully equipped process laboratory and TSE workshops. Somerville, NJ • sales@leistritz-extrusion.com FULLY AUTOMATIC SCREEN CHANGERS HITECH™ screen changers operate on a truly continu- ous principle in harmony with the rest of the e xtru- sion process. The screen, in the form of a long ribbon, moves slowly through the screen changer at an infi - nitely adjustable rate to blend smoothly with the polymer flow . Hackensack, NJ • aalroy@screenchanger.com DRI-AIR INDUSTRIES, OUR NAME SAYS IT ALL The industry leader in proven desiccant dryer technology, Dri-Air offers the highest quality at competitive pricing. Our constant attention to detail and incredible response time helps us sell thousands of drying systems worldwide. We offer solu- tions to a wide range of industries from simple to complex custom applications. Our name says it all 1 The Dri-Air System 3 HPD 4 Bed Portable Dryers 4 Portable Dryers – Controls & Closed Loop Loader 5 APD Portable Dryers 6 Closed Loop Loading Systems 7 Quick Material Change Systems 8 Hopper Bank Series 9 Central Loading System 10 Central Drying Systems 11 Floor Mount Dryers 12 Drying Hoppers 13 Hopper Mount & Mini Dryers – Desiccant 14 Mini PD Dryer – Desiccant 15 Hopper Mount & Mini Dryers – Compressed Air 16 Mini PD Dryer – Compressed Air 17 Blending/Drying Exclusives – Virgin & Regrind, Virgin & Colorant 18 Blending/Drying Exclusives – Virgin, Regrind & Colorant Since 1974 Dri-Air has been the industry leader in proven desiccant dryer technology, offering the highest quality at competitive pricing. Our constant attention to detail and incredible response time has helped us sell thousands of drying systems worldwide. From 1 pound to 3000 pounds per hour, we offer solutions to a wide range of industries from simple solutions to complex custom applications. DRI-AIR Industries, Inc. w w w . d r i - a i r . c o m 16 Thompson Road, PO Box 1020 East Windsor, CT 06088-1020 T: 860.627.5110 F: 860.623.4477 P R O U D L Y M A D E I N T H E U S A Visit us online East Windsor, CT • sales@dri-air.com FILMEX ® CAST FILM EXTRUSION SYSTEMS W&H's modular cast film line for PP, barrier, stretch and specialty film up to 11 layers. Designed for widths up to 142" with a film thickness of 0.4 – 12 mil. Maximum output of 3,600 lbs/hr. Lincoln, RI • info@whcorp.com PLASTIC PIPE GR ANULATORS Original Pallmann Pipe Crushers can be used for size reduction of plastic pipes consisting of PE, LD, HD, MD, PP, PVC, ABS, etc. down to extrudable gran- ules. Proven horizontal feeding system handles full length & up to 36" d. pipes, as well as cutoffs. Custom models also available. Clifton, NJ • info@pallmannpulverizers.com AQUATHERM TEMPERATURE CONTROLLERS RQE Series Temperature Controllers are built for dependable operation using quality components such as high flow pumps, twin tank assemblies, and Incoloy sheathed heaters. The large, user-friendly controller interface makes operation simple and also provides a wide array of system and diagnostic information. Niles, IL • info@thermalcare.com THE SOLUTION TO KNIT/FLOW LINES Per-Fix™ Flaw Repair Coatings—The Solution to Knit/Flow Lines. Chem-pak's patented line of coatings helps you eliminate most cosmetic flaws common to injection molded plastics. Designed specifically for matte- finished, color-coded, textured, interior parts. Martinsburg, WV • info@chem-pak.com MELT FLOW TESTERS Melt indexer comes in manual or motorized versions and loaded with capability and efficiency: three-zone heaters; touch screen control; tapered weight design; simple die release; USB connectivity and Horizon software for SPC analyses; optional manual or motorized extrudate cutter. 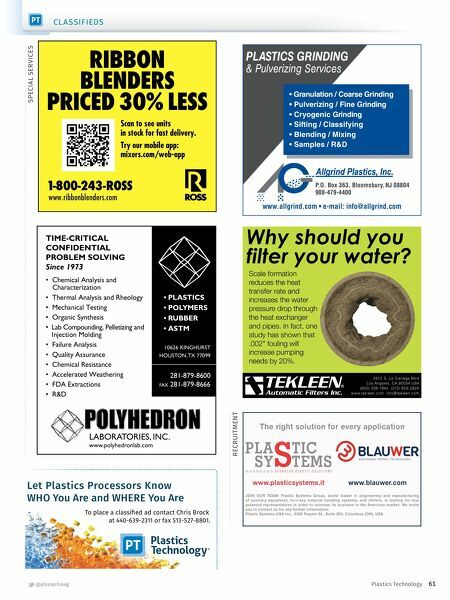 Horsham, PA • sales@tiniusolsen.com 60 JULY 2018 Plastics Technology PTonline.com PROGRESS THROUGH INNOVATION Complete overview of the company, its history and the relentless product developments that have made it the leading manufacturer for plastics processors worldwide. Its innovative products include injection molding machines, robots and automation systems, auxiliary equipment . 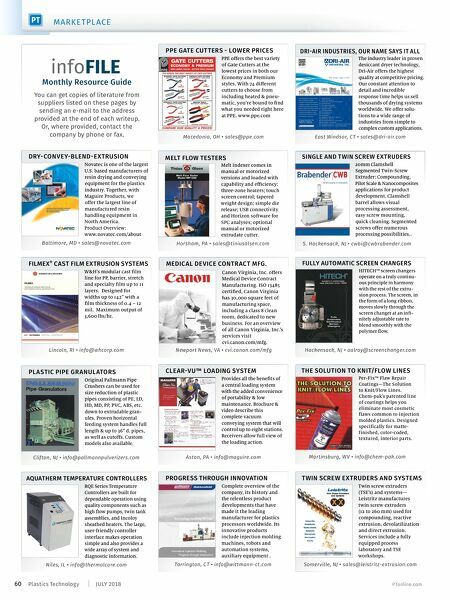 Torrington, CT • info@wittmann-ct.com M ARKE TPL ACE You can get copies of literature from suppliers listed on these pages by sending an e-mail to the address provided at the end of each writeup. Or, where provided, contact the company by phone or fax.